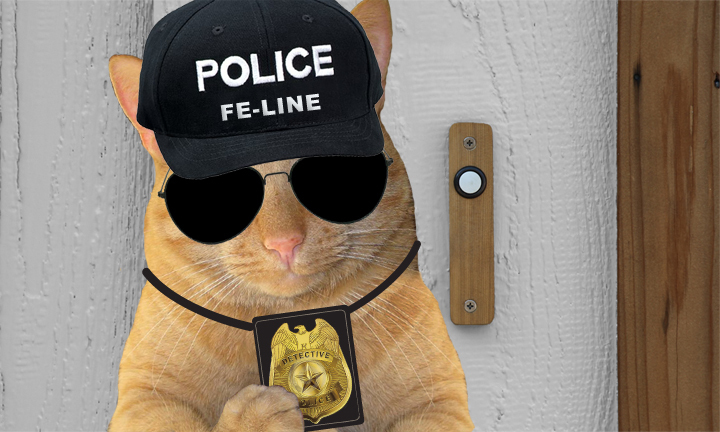 The blogosphere is buzzing about the orange Police cat behind those Foster Grants. In fact, a rumor was started on Facebook accusing him of not even being a REAL cat! Can you imagine? Little did they know the badge-carrying cat that hauled me off in cuffs was none other than Wally The Island Cat! We had a chance to interview all three Island Cats – Wally, Ernie & Zoey – about the video and Wally’s groundbreaking role. WALLY: My favorite part of the video is ME, of course! But seriously, I really like the part where I got to drive the Fe-Line Unit Van with all the sirens going!! I never get to drive, so you can only imagine how much fun I had! And just think…we did that in ONE take! KATIE: Wally, with the way you were taking those bumps, thank Cod it WAS only one take. WALLY: Oh yeah…and I really liked seeing my name in the credits. Now when do I get my SAG card? KATIE: Don’t you mean CAG? KATIE: So Zoey, what do you think about the video? ZOEY: Katie, I wish I would have just eaten that shoelace. At least there’d have been no evidence. KATIE: Thanks for being so willing to take one for the team, Zoey. But I’d hate for you to end up at the V-E-T with a shoelace showing up in your xray. They’d have to get it out, then probably report it to the Fe-Line Police Unit...then the press would get wind of it... Heck we’d BOTH be in the slammer. KATIE: And Ernie, or should I call you Juror #6? What are your thoughts? ERNIE: Katie, I wanna know if that shoelace has been tested for DNA! Until we see the results, I’m not convinced anybuddy is guilty! KATIE: Couldn’t agree more, Ernie. Still, I’m concerned there may be evidence tampering. Those CSI’s can be real DOGS. 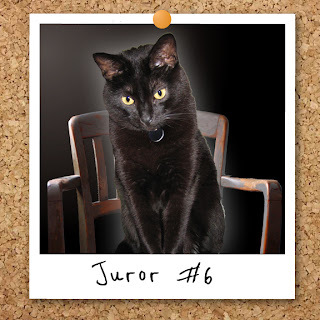 Not to mention that suspicious Juror #10. We have a super-fun bonus for you today! Answer the following trivia questions about Wally and “Katie Is…ACCUSED.” The first to answer completely and correctly will be featured on an upcoming GLOGIRLY blog post! Q: How many scenes did Wally appear in? Q: What character(s) did he play? 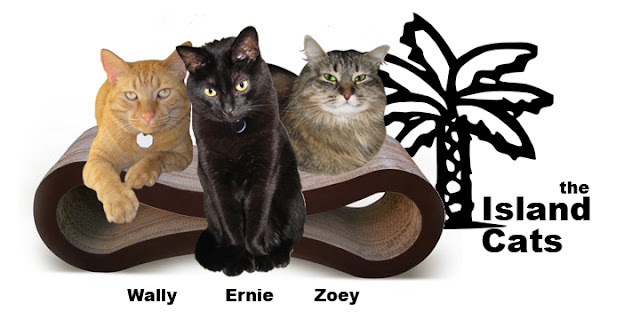 WE'RE FINALISTS IN PURINA'S THE FRISKIES CONTEST FOR BEST NEW INTERNET CAT VIDEO OF 2012! Please visit The Friskies Facebook Page - For every comment, every like, and every vote, they are donating 5 cans of food to some very deserving shelters. They're already at over 200,000 cans! If you haven't already, please CLICK HERE to WATCH & VOTE for "Katie Is...ACCUSED"
THANK YOU FOR WATCHING, VOTING & SHARING! 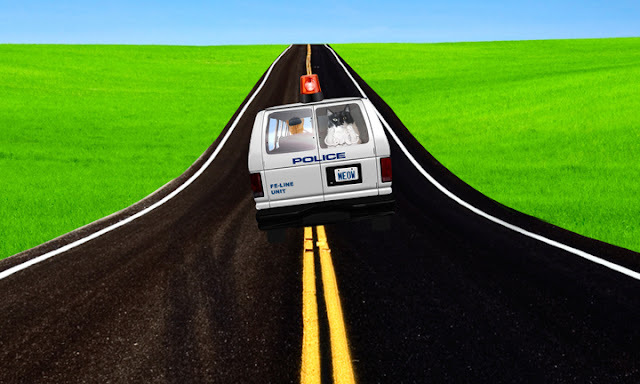 How come when Wally was driving that van, speeding down the highway, he was crossing the double yellow lines? I mean, what was the hurry? He had Katie in custody. I think he was just showing off. How many scenes Wally appeared in ?? If you ask me it was just TOOO MANY !! What character he played ?? Me I think he just was showing off ! This is a trick question! Wally is in 3 scenes...he is the cop who comes to the door to arrest you and drive off...his paws are holding the Free Katie sign...AND he's on the jury! We're so glad you posted this. We thought it was an appearance by Waffles! Sorry, Wally. We think Wally was pawsome in the whole thing! BOL that's our favorite part too! Ok, everybody! Cory is REALLY close...but she's missed ONE important scene! Can anyone name the 4th scene??? I hope Glogirly had fun at Barkworld. I wonder if there is a MaaaaaWorld? Wally ain't much of a driver is he? OOooohhhh...Wally's photo is on the wall in Katie's jail cell! Wally is too like Waffles, except he is um more eloquent!! So We think he is in four scenes, but do you count his arm when serving the warrant? He played policeman and juror!! And was that Wally or Waffles pinned to the wall in Katie's cell? We need to know!! So when you think about it, it's a stitch up for sure. Free Katie!! Free the Minneapolis One! Hey, my Mommie drives crazy like that all the time and she is not even taking criminals in to jail. What a wonderful interview - Wally drives way better than most of the humans where we live in South Florida, so kudos for that, Wally!! I personally would like to see Waffles driving, but I don't imagine he'll be getting a license any time soon!! Good luck on the video - we have been campaigning nonstop to help Katie!! Is Wally going to come and arrest mes too for bringing yous the file? Me thinks he's in 2 but parts of his body is in 2 more! Wally is a man cat of many talents! Come and arrest me officer Wally! Me is ready! Katie, I still can't believe that there were some peeps who didn't think I was real!! Thanks for letting me do my own stunt driving. It was fun! And thanks for featuring us today...I'm not sure how many scenes I was in!! Allie: WALLY's pinup...on the jail cell WALL?!?!? Katie! I'm totally running over to CK to dish with her over your latest crush! That was Wally driving?? Thank Cod it wasn't Waffles! They aren't related, are they? Wally is my hero...he makes one cool Police Fe-line for sure! What a fun post! We think Cory has it now about the 4 scenes.